Our patent-pending Coat Of Silence resilient layer (base coat) is scientifically formulated to deflect sound transmission with a 52 STC rating. 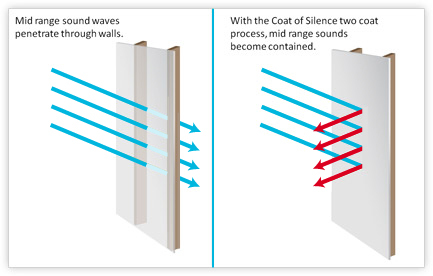 The base coat forms nano membranes that create sound absorbing and sound deflecting barriers. Our Finish Coat has the same sound deflecting formula to complete the sound reduction system. Our product was tested in accordance with ASTM E90-09 and E413-04 as well as UL tested. Underwriter Laboratory has been testing products and helping to define standards for more than 75 years and they evaluate more than 19,000 types of products, components, materials and systems a year. With these testing standards, you know Coat of Silence silences the competition, as well as the room.